The approval of a pacemaker that works without the use of wired leads is being heralded as a major win for patients at risk of complications from traditional devices. But cost and potential limitations on how it performs could hinder widespread use of Medtronic's Micra Transcatheter Pacing System. The 1-inch device, the world's smallest pacemaker, is implanted directly onto the heart's right ventricle chamber and uses prongs that generate electrical impulses to regulate heart beats in the same fashion as traditional pacemakers. Conventional pacemakers require electrodes to be inserted through a large vein into chambers of the heart. The device is implanted just under the skin below the collarbone. Though complications of this implantation are uncommon, the electrodes can break, become dislodged or become infected, requiring subsequent procedures. Micra inserts through a vein in the patient's groin and then affixes to the heart. A clinical trial involving 719 patients implanted with Micra found 98% had adequate heart pacing six months after implantation with complications occurring in less than 7% of trial participants, according to the Food and Drug Administration. Many professionals see Micra as a major advancement in technology that has remained largely unchanged for decades. But the device carries a big price tag. Medtronic has not disclosed the device's actual cost. But the estimates of about $10,000 compared with conventional pacemakers that average about $2,500 is raising some eyebrows, especially among hospital officials whose facilities receive lump sum Medicare payments for such procedures. Dr. Bruce Lindsay, section head for Cardiac Electrophysiology and Pacing at the Cleveland Clinic's Heart and Vascular Institute, said the institute is increasingly being pressured to keep costs down. Cleveland Clinic conducted clinical trials for Micra, implanting the device in as many as 10 patients. Micra regulates activity for the lower chambers of the heart. The vast majority of pacemakers implanted in the U.S. are dual-chamber devices, which work in both the upper and lower chambers. Deborah Wang, senior analyst at investment research firm Morningstar, says at this point the Micra is a niche product for patients not well-suited for a traditional pacemaker. “Medtronic is in a position where these patients have fewer options, and you can charge a higher price—that is something that is much more short- and mid-term,” she said. According to a 2012 study in the Journal of the American College of Cardiology, use of dual-chamber pacemakers grew from 62% in 1993 to 82% in 2009, while single-chamber devices fell from 36% to 14% during the same period. Dr. Rod Passman, a professor of medicine-cardiology and preventive medicine at Northwestern University, disclosed working as a consultant on Medtronic's other cardiac-related devices. He said he did not work on Micra. Passman said it was only a matter of time before dual-chamber leadless pacemakers became a reality as well. Lindsay believes Micra's cost may drop as Medtronic produces more devices and competitors start to enter the market. 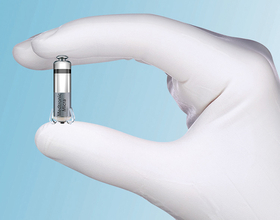 One of which, the Nanotism leadless pacemaker from St. Jude Medical, is expected to gain FDA approval later this year. Costs aside, Micra's performance in the market might be affected by some of the device's potential limitations, including its battery life. The company says Micra is estimated to have an average battery life of more than 12 years, which would make it comparable to the average battery lifespan of pacemakers with wired leads. Retrieval of the device is another possible issue. According to the Medtronic, though the design of Micra enables it to be taken out when needed, it was intended to be left in the body. Patients in need of another device would have their pacemaker permanently shut off and stay in the body while a new device is implanted and used. “If it turns out it that these are just as easy in terms of replacements and they work just as well then I wouldn't be surprised that over time we may migrate to a point where this kind of a leadless product is the gold standard and it becomes the main go-to product for most patients,” Wang said.